This illustration depicts a Mn24C18 cluster carrying a magnetic moment of 70 Bohr magnetons. Credit: Menghao Wu, Ph.D./VCU. (Phys.org) —Virginia Commonwealth University researchers have discovered, in theory, the possibility of creating large, hollow magnetic cage molecules that could one day be used in medicine as a drug delivery system to non-invasively treat tumors, and in other emerging technologies. 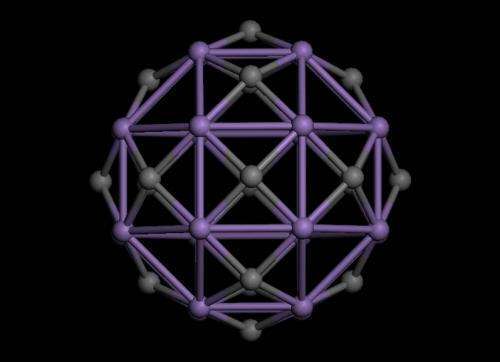 Approximately 25 years ago, scientists first made the discovery of C60 fullerene – better known as the Buckminster Fullerene – a molecule composed of 60 carbon molecules that formed a hollow cage. Due to its unique hollow cage structure the molecule offers serious technological potential because it could hold other atoms or small molecules inside, and therefore, be used in applications such as drug delivery. That potential has since spurred worldwide interest among scientists who have been searching for similar molecules. Although some hollow cage structures have been found, none of them is magnetic. Magnetic properties of the structure are of particular interest because a hollow magnetic structure carrying an embedded atom or molecule can be guided by an external magnetic field and may serve as an effective vehicle for targeted drug delivery. In a new study, published online on July 22 in The Journal of Chemical Physics, two VCU scientists employing state-of-the-art theoretical methods show that magnetic hollow cages larger than the original C60 fullerene that carry giant magnetic moments are possible. A magnetic moment refers to the measure of the magnetic strength of a cluster. An illustration of the VCU discovery also is featured on the cover of the July 28 print issue of the journal. "The potential benefit of this finding is that it provides a route to the synthesis of molecular magnets with colossal magnetic moments," said co-lead investigator Puru Jena, Ph.D., distinguished professor of physics in the VCU College of Humanities and Sciences. Jena collaborated with Menghao Wu, Ph.D., co-author of the paper and a postdoctoral scholar in the VCU Department of Physics. "These molecules can be used for targeted non-invasive drug delivery. When assembled, the molecules can also form new high strength magnets for device application," Jena said. According to Jena, the pair of VCU researchers demonstrated the magnetic moment of the molecule by focusing on hetero-atomic clusters consisting of transition metal atoms such as cobalt (Co) and manganese (Mn) and carbon (C) atoms. In particular, Co12C6, Mn12C6, and Mn24C18 clusters consisting of 12 cobalt and six carbon atoms, 12 manganese and six carbon atoms, and 24 manganese and 18 carbon atoms, respectively, carry magnetic moments as large as 14, 38 and 70 Bohr magnetons. In comparison, the magnetic moment of an iron (Fe) atom in crystalline iron is 2.2 Bohr magnetons. According to Jena, the team is still early in its discovery process. "There is a long way to go. Experiments first have to be carried out to prove the predictions of our theory," said Jena. "Ways must be found to synthesize large quantities of these molecules and study their magnetic properties once they are assembled. Finally, these molecules need to be functionalized by embedding desired atoms/molecules for practical applications." According to Jena, the pair of VCU researchers demonstrated the magnetic moment of the molecule ….. This is interesting, maybe understanding the mechanism which explain how electron spin create magnetic field, could speed up the research…. Magnetism is still magic to me, personally - hard to wrap my head around - but I have to wonder if this magnetic feature would be used to guide, or to unlock these molecules when they reach their destination, or even just heat up the target if it's a tumor to kill off targeted cells. They would probably show up bright as silver pebbles in an MRI, so they might act as tracer, vehicle, delivery system, and targeted heating mechanism. If they work... they could be a real boon.